The North American and European continents are moving apart at a rate of about 3 cm/y. At this rate how long will it take them to drift 500 km farther apart than they are at present? This is College Physics Answers with Shaun Dychko. Average velocity is displacement over time and we're going to use this as a starting point and do some algebra to solve for delta <i>t</i> in order to find the amount of time it'll take for the European and North American continents to separate by 500 kilometers, given a piece of separation of 3 centimeters every year. So, this is the average velocity this 3 centimeters per year and the displacement will be 500 kilometers. So, we will multiply both sides by Delta <i>t</i>. That makes it disappear on the right side because it cancels there and on the left side, we're left with Delta <i>t</i> times <i>v bar</i> equals delta <i>x</i>. And then, divide both sides by this average velocity. And then, it shows up on the right hand side in the denominator and it cancels on the left and now we've isolated <i>t</i>. So, time is going to be this 500 kilometers further separation between continents divided by 3 centimeters per year. Now, this calculation illustrates why it's important to always put units in your... when you substitute in numbers because by putting in units here, we can really see that the units are different in the numerator and the denominator. And that's a problem when you have, you know, a length in the top and length in the bottom of a fraction. Those lengths have to have the same units and likewise for time if you're dividing one time by another. You should have the same units and in whatever dimension you're talking about be it charge or whatever. Make sure you pay attention to having... units usually need to be the same unless you have some good reason for them not be the same. I mean, right here, they're not the same in this fraction because it's a conversion factor and the whole point is for it to make the centimeters disappear, leaving us with meters, and then, here's another conversion factor. Multiply it by 1 kilometer for every 1000 meters to make the meters cancel and we will be left with kilometers per year in the denominator. 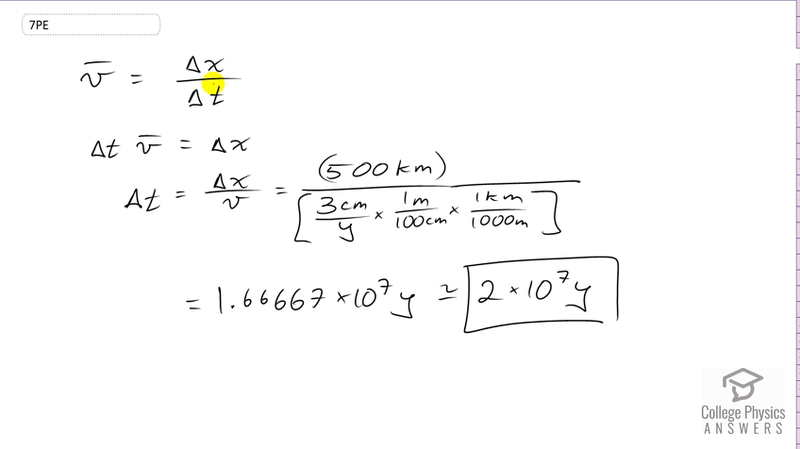 And so, the kilometers in the denominator here will cancel with the kilometers in the numerator there. And so, this works out to 2 times 10 to the 7 years which is 20 million years for the continents to separate by 500 kilometers.